We feel as though the Largillieres have come back home. This home was listed in 1991 on the National Register of Historic Places as the "Edgar W. Largilliere Home." This home has been newly renovated, keeping the old time charm, yet still has modern comforts. It is romantic and filled with antiques and vintage memorabilia. A peaceful balance of comfort and cleanliness with a full breakfast served. The Edgar Walter Largilliere, Sr. House is a detached, one and one-half story shingle style residence. It was built as a house-pattern style home before 1899 and extensively remodeled to its present appearance about 1938. The historic and architectural value of the property flows from the ca. 1938 remodeling, and there are few remnants of the ca. 1899 design and configuration extant. The original floor plan was a simple rectangle with the gable front facing the street. The remodeling included an addition which makes the present appearance an inverse “L” shape, with the leg of the “L” lying perpendicular to the street and the base projecting toward the East in line with the back of the house. The top of the “L” is the front elevation. The main entrance is located in the inside corner of the “L”, where a decorative chimney of textured brick is also positioned. The base extension of the “L”, chimney and location of the entrance door were products of the ca. 1938 changes. The dominant feature of the front is a long low porch that wraps around the façade and terminates at the entrance. This was also added ca. 1938. Construction is entirely of wood with the original portion of the house built over a foundation and cellar made of lava rock rubble. The addition has a concrete foundation. The principal exterior cover is square-cut cedar shingle on the walls, the porch columns and the roof. Decorative wooden moldings trim the gables and eaves. The upper portion of the front gable encloses a diamond shaped shingle pattern that adds texture and interest to the design. The shingle surface is original to the house. Typical windows are six over six in configuration, common for homes of the period built in revival styles derived from colonial origins. The windows were all new ca. 1938, with the possible exception of one in the rear gable of the house which is taller than those in the front. The size and massing of the house, even though originally built at the end of the Victorian Era, are of a style more typical of homes built at the time of the remodeling. Ceiling heights are about eight feet and interior doors have no transoms or Victorian embellishments. The porch deck is wooden plank. The ceiling is made of beaded moldings typical of decorative construction in the first half of the century. In 1976 a bank occupied the property and a drive up window and canopy was added to the East façade. A night depository device was also installed. In 1990-91 the current owners added a shingle covered addition to the Northwest allowing a kitchen to be created so the house could be used as a restaurant and bakery. The addition has a low, sloped roof that makes it easily distinguishable as an alteration. It is faced with shingles and horizontal wood moldings to blend with but not mimic the original fabric of the exterior. Neither of these changes has affected the significant front façade of the dwelling, which remains completely intact from its 1938 appearance. The entry hall, living room, dining room and bath on the ground level remain virtually unchanged from their ca. 1938 configuration and appearance as well. The original interior doors, glass hardware, texture of the plaster, stair railing and terracotta fireplace remain. The bathroom retains its original elegant ceramic tile and fixtures. The kitchen was redesigned to adapt to the current use. A room off the entry hall was changed to accommodate the bank drive-up window in 1976. Other than these changes, which have been made in ways that intrude as little as possible on the main interior rooms, the interior remains much as it was in the 30’s. The hall closets remain unchanged. New windows were installed in the kitchen and more insulation was added to the home to increase efficiency in 2013. Another exit door from the second level was required by fire codes and installed in the East gable of the house, over the new canopy installed to cover the drive-up window. Stairs lead from the roof down to the ground level on the back of the house. The doors have divided lites so as to soften the visual impact on the design of the house. The upper bathroom remains as the single least changed part of the house from the original ca. 1899 construction. The porcelain tile floor, pedestal sink and old style toilet remain from the earliest period of the house. The tile on the shower surround was added in the 2013 renovations. Throughout the house, the original steam radiators remain. Elegant glass hardware, four panel doors and even the face of the china closet have been preserved. The grounds of the house are dominated by a few large trees which are obviously decades old and serve to mask the changes made to the original home over time. The rear is developed as required by local codes into parking. 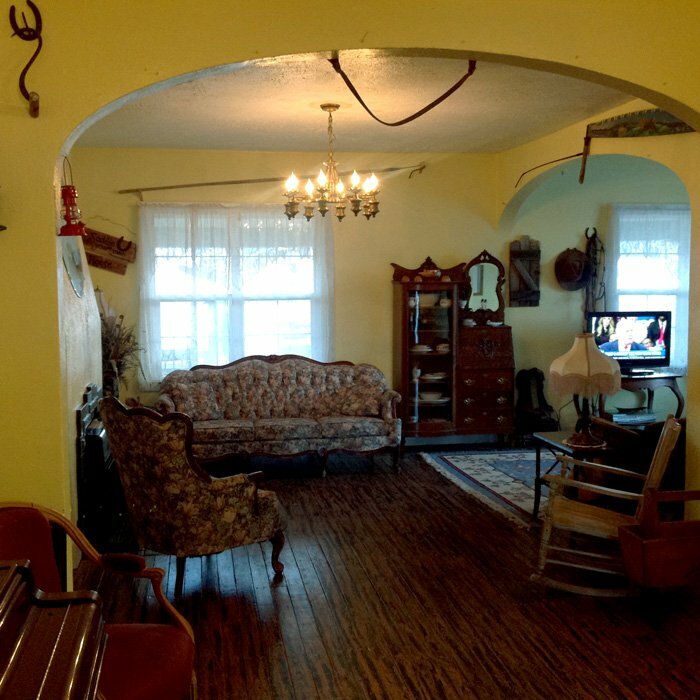 The Largilliere, Edgar Walter, Sr. House is the only building extant relating to a family who was one of a few that dominated the business and government life of the Soda Springs area for a period of six decades. It is also a remarkable example of an unusual architectural style not found in any other residence in community. 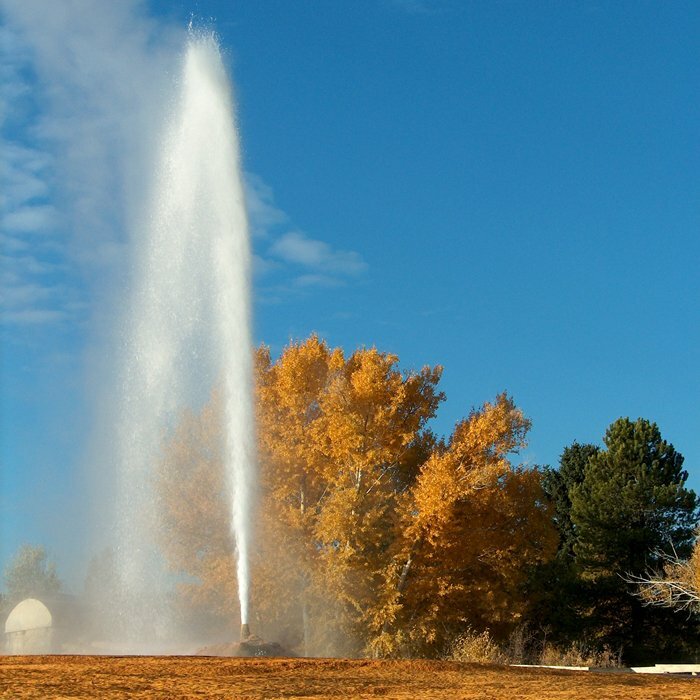 Soda Springs was founded in 1863 as one of the oldest permanent communities in Idaho. In 1870 a new town site was platted and Second South Street became the main road through town, eventually known as US Highway 30 North. Early commerce in the area revolved around agriculture, with sheep and cattle ranching as mainstays. As one of the featured campsites on the Oregon Trail, still in sue for those who chose not to sue the new intercontinental railroad, Soda Springs played an economic role in the history of the development of the West. The town hosted the most Northern location of a branch of the Zion’s Cooperative Mercantile Institution headquartered in Salt Lake City, and was also planned as the terminus of the Utah Northern Railroad, designed to carry goods from the area back to the center of the Mormon economy in Salt Lake. In 1882, a dramatic event cemented the town’s commercial role when the Oregon Short Line railroad went through, linking the Union Pacific at Evanston, Wyoming with the Pacific Northwest. Markets were opened in all directions and Soda Springs became an important shipping point for cattle, sheep and agricultural products. Into this environment in 1881 came August Largilliere, a French immigrant who had arrived in American two years earlier. After living two years in Evanston he moved up the Oregon Trail/Short Line route a few days travel to Soda Springs and began a series of business ventures that resulted in his acquiring significant wealth. Among his enterprises were a brewery, a dry goods store, grocery store and in 1904, the Largilliere Bank. Each was the largest of its kind in the area. He also owned 1700 acres of land and several hundred head of sheep. The major Largiliiere enterprises were located in the immediate vicinity of the intersection of Main Street and US Highway 30…..the busiest corner in town. A large commercial structure was built around the turn-of-the-century that included a grocery store, dry goods store and the bank, each in a separate store front. Just to the West of the store and bank on Highway 30, August made his home. In 1911 his son Edgar Walter Largiliiere, Sr. acquired the house across the street North, which is the subject of this nomination. Edgar was born in Evanston in 1881 and came that year to Soda Springs with his family. Upon the death of his father in 1927, Edgar took over the Largilliere establishments and operated them until his own death in 1951. Edgar served on the School Board for twenty-seven years. From the turn of the century until his death he was one of a few whose influence steered the course of the community. The E.W. Largilliere House was remodeled extensively about 1938 following Mr. Largilliere’s second marriage. Reflecting the owners’ taste and affluence, a turn-of-the-century house which was probably quite plain was transformed into one of the two or three unique and elegant homes in the community. About 1955, the Largilliere store and bank burned to the ground. It was replaced by a contemporary masonry bank building, now the Soda Springs City Hall. A few years later the August Largilliere house was demolished to make way for a supermarket. The Largilliere Bank was absorbed by another bank in the seventies and the Largiliiere name ceased to be a symbol of commerce in the area after eighty years of success. Mrs. E.W. Largilliere left the home in 1955, four years after her husband’s death, and it was sold out of the family. The house served as residence until 1976 when it was altered to serve as an office and drive-up bank. In 1990 further changes were made to accommodate a restaurant. There are not better examples in the county of the shingle style, and no other period structures left from the Largilliere enterprises other than a prominent mausoleum in the city cemetery. The front façade of the home and the important interior rooms remain virtually unaltered from the period of the Largilliere’s residence there. The Largilliere house and another home to the immediate West are the only buildings near the main intersection that predate 1955. All the other significant structures related to the important commercial enterprises that once existed on this major East/West route through the area are gone.